Most member companies of the Chamber are significantly less confident than last year about Taiwan’s economic outlook over the next 12 months, but were more positive about Taiwan’s three-year economic outlook. Companies were also more bullish about their own profitability over the next 12 months and three years. Factors causing concern for global companies included the ongoing U.S.-China trade dispute, the U.S. administration’s “American First” trade policy, pressure on Taiwan from China, and cybersecurity threats. 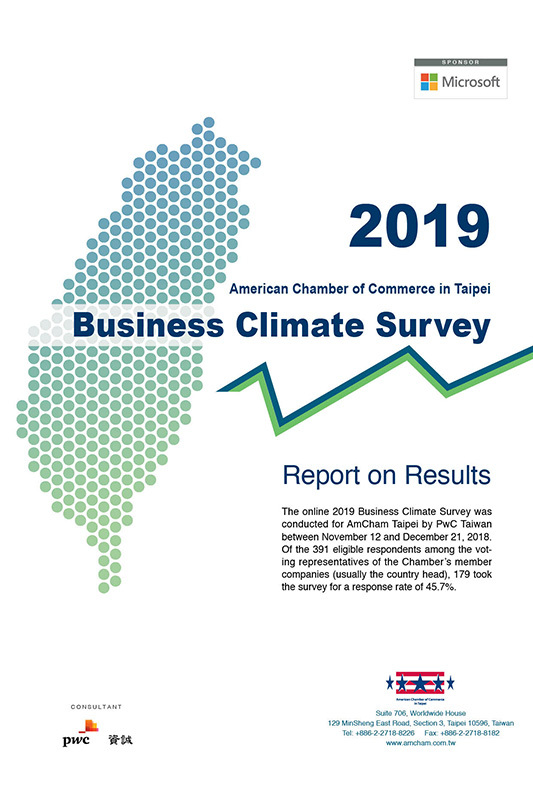 Those were the major findings of the 2019 Business Climate Survey, conducted for AmCham by PwC Taiwan. The results were released at a press conference, followed by a membership luncheon, on January 23. The results of the online survey, which had a 45.7% response rate, were based on responses from 179 members polled this year between Nov. 12 and Dec. 21, 2018.